Probably one of the most important and tricky things to learn as a parent is how to discipline our children so they learn right from wrong, while always making sure they know they are loved, regardless of what they do. 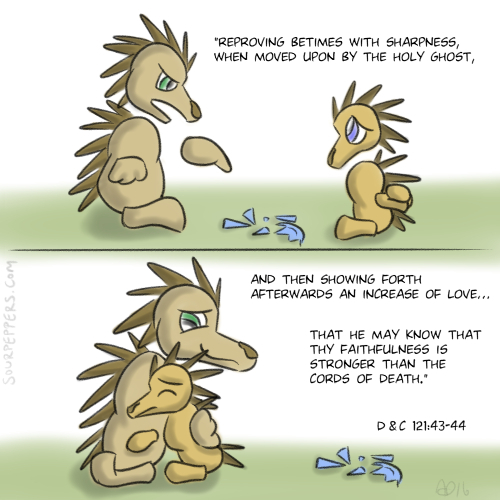 D&C 121: 43-44 explains how we are to reprove with sharpness when necessary, but then show forth an increase of love. Even though I've only been a parent for two years now, I've been able to practice this principle and see its effectiveness in raising my daughter. There have been days (and I'm sure there will be many, many more!) when she's been quite the troublemaker. But when disciplining her, I try to remember to also show her that I love her. And she, bless her heart, is so quick to forgive, even after being very upset for being put on timeout for the third time in one day! I am of course not a perfect parent. But I'm trying to be more like the One who is by following His counsel. I learned long ago that sharpness means exactness. It has nothing to do with the tone of our reproving (which should always be loving) but the content. We should teach our children, letting them know exactly what they did wrong, and what they can do differently. Discipline = teaching An entirely different conversation is the fact that parents often equate "makes it inconvenient for me as a parent" with "wrong" which is not the case. . .
Ooh, that's a good insight. Thank you! It makes me think of how our Heavenly Father reproves us when we've done something wrong. He doesn't sugar coat it, and sometimes that stings. But neither is He needlessly cruel. He lets us know how we can be better. I disagree with Aaron's point. I think tone can be important. If Jesus hadn't been so forceful in the temple, would the moneychangers have left? I think force of voice and a sharp tone are needed from time to time. In fact, experimenting on this scripture has made it among my favorites. One time, my brother and I were out at a favorite restaurant, along with my parents. My mother mentioned a sibling that was struggling with something serious and he said, "aww, who cares?". I immediately responded, "How could you?" I was told that maybe it was a bad idea to do that. (I mean, it was considered loud, and Mom didn't want my brother to be embarrassed). But I felt no regret, and quickly made sure to follow that up with words of kindness. I felt I had just plain done the right thing. I felt peace. Sometimes we have to do things that put us at odds with those we love for their sake. A master of the tongue knows when to speak and when not to speak, but also how to speak and how not to speak. Sometimes, I believe, that may mean taking a different tone than usual. Certainly a loving tone isn't monotone.